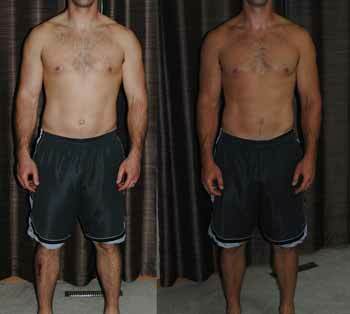 Darren was an online training and nutrition client located in South Dakota. Read what he has to say about working with me and the results he’s gotten through his Growth Stimulus Training experience and nutrition program. Darren first followed a training and nutrition program to lean out along with weakpoint training to build his shoulders. He later transitioned to a maintenance and muscle building phase to add size to his physique. Darren’s Before and After pictures span a 14 week timeframe and show what is possible to achieve with the right nutrition and a proven program to retain, or even build muscle, while dieting. In the 18 weeks that I worked with him, Darren lost 16 lbs and then began eating and training for size. He now has a great foundation in both fitness and nutrition to continue improving his physique for years to come. 1. What’s one thing that you’d like me to start doing? Adrianne, there is nothing you could do differently. Everything was spot on! The one thing I had to remember is what you had me do was only as good as the feedback I was giving you. 2. What’s one thing that you’d like me to stop doing? 3. What’s one thing that you’d like me to keep doing? Keep rocking at what you do! You are a phenomenal coach and I have enjoyed this experience. 4. Can you describe any reservations that you had before we started working together? I was apprehensive about the whole “virtual” idea but what you had done with my wife was amazing! If she could so it, so could I. 5. Can you explain how I was able to help you with your reservations? Open and honest communication is the key to this program. You made communicating so easy and you were always there when I had a question or needed advice. 6. Can you describe your 1-2 top goals when you started? Gain strength and lose some weight. Learn how to eat better! 7. Can you list your achievements with training thus far? 8. Is there anything else at all that you’d like to add? Adrianne, you are an absolute joy to work with. Any questions or concern I had you quickly answered or gave advice on. You have taught me how to take of myself without having to buy into any crazy programs or gimmicks. You have equipped me with the tools and rules I need to use to continue my journey. Thank you for such a wonderful experience! To find out more about working together and what we can achieve, email me at adrianne@growthstimulustraining.com. Assessments are always free.